Lofthouse, a small village about a mile south of Middlesmoor, has a primary school, memorial village hall and like Middlesmoor has a pub also called the Crown Hotel which offers en-suit accommodation. The hotel is situated on the Nidderdale Way in an Area of Outstanding Natural Beauty. The Nidderdale Caves lie just north of the village. The River Nidd runs underground through the caves and emerges at Nidd Heads just south of the village. The normally dry surface bed of the river passes the village to the west. Lofthouse had a railway station between 1907 and 1929. We did this walk after the bad snow storms from the Beast of the East. 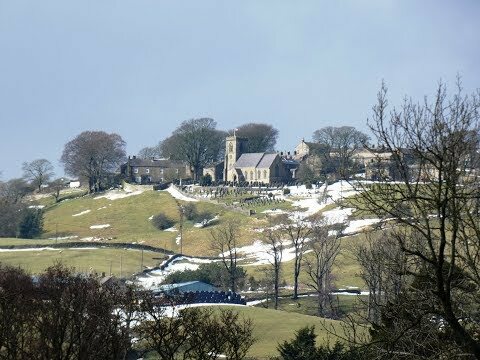 From Middlesmoor car park we turn left downhill into the village and turn left opposite the telephone box to the church. At the church entrance gate we turn right to cross over a stile. We go down the steps then head forward downhill through the field to the farm ahead. We pass through the centre of the farm and follow the arrow slightly right downhill. At the clump of trees we bear right following the wall to pass through the stile. We head forward to the right of the barn and cross another stile marked with yellow. We cross the field and go through a gate to meet the road. We turn immediate left and walk between the fence lines to meet a tarmac track. We cross straight over, fire station on our right, and go through a gate to cross the bridge over the river. We follow the path through a gate in to Lofthouse. At the road we bear right. At the car park you can turn left and take the Pennine Way which meets up with the road just beyond the village but we head forward through the village to see what’s there. At the t-junction we bear left along the road. The footpath on the left is the one that joins the road from the car park. We keep heading forward and take the footpath on the right, The Pennine Way, across the fields until we meet the road. We cross straight over and bear half right uphill to the wood. With the wood on our left we head forward past a building and when the path splits we take the right path. At the next building we go through the gate on the left and continue ahead through the fields to a farm at Bouthwaite. We cross over a little bridge pass through the farm and follow the track bearing right. We turn right again and follow the tarmac track to the road. At the t-junction we turn left over the bridge. Just as we enter the village of Ramsgill we turn right following the footpath sign through a gate at the side of a house. We continue on the Pennine Way with the river on our right through the fields to West House Farm. At the farm we ignore the stile on the right and go through the gate and farmyard, to a gate at the far side with a blue arrow. We continue forward with the wall on our left and continue through the fields to the left of a stone barn to pick up a track. We bear right crossing the bridge over the gill and keep following the track until we come to a t-junction. We turn right downhill towards the caravan site. At the bottom we turn left with following the stream on our right. When we meet the road we keep heading straight forward with the stream still on our right. We now keep following the no-through road passing How Stean Gorge on the right towards the village of Stean. Before we reach the village we turn right at the footpath sign at the side of a stone barn. We go through the stile and head downhill to cross over the gill at the bottom then we head forward uphill making our way through the fields towards the church at Middlesmoor. At the road we turn left and follow the road through Middlesmoor to the car park. This is a moderate walk on the Nidderdale Way through grass fields, on gravel/grass paths/tracks and some minor tarmac road. There are some steep inclines and declines. Approx 6.6 miles allow 3 – 3½ hours using OS Explorer Map 298, Nidderdale, Fountains Abbey, Ripon and Pateley Bridge. This walk is done clockwise. Start point: Free car park at Middlesmoor. Middlesmoor, north-west of Pateley Bridge, is in the Nidderdale valley in the Yorkshire Dales. In Pateley Bridge take the road opposite the show ground passing between the garage and the park area. Follow the road passing Wath on the right and continue following the road at the side of Gouthwaite Reservoir. Pass through Ramsgill then past Lofthouse to arrive at Middlesmoor. Continue through the village and the car park in on the right. Parking: Free car park at Middlesmoor. There are public toilets at Middlesmoor, Lofthouse and Pateley Bridge. For refreshments there is a pub at Middlesmoor the Crown Hotel, a pub at Lofthouse also called the Crown Hotel and a pub at Ramsgill, the Yorke Arms. There is also the Sportsmans Arms at Wath. For more choice there are shops, pubs and cafes in Pateley Bridge.